So it’s a good time to think about how we should make sure screening is accessible for people who are blind or partially sighted. Braille is only one of several ways in which people with sight loss access information. 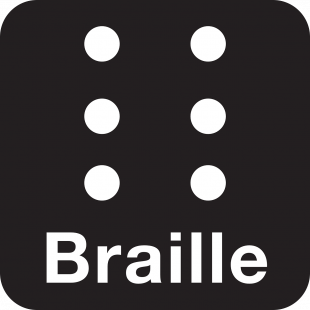 Demands for Braille are declining as visually impaired people increasingly use email, SMS text, websites and apps on smartphones or other devices equipped with assistive technology. The RNIB leaflet for GP practices at the bottom of this blog article summarises these different formats and explains the scale of the issue. For example, one in 180 people are registered with visual impairment and need information in an alternative format. Nationally and locally, screening services have a responsibility to do 5 things to make screening equitable for people who have a disability or sensory loss. Highlight or flag the person’s file or notes so it is clear they have information or communication needs and how to meet those needs. Take steps to ensure people receive information which they can access and understand, and receive communication support if they need it. Many of the above responsibilities can only be met at a local level. Nationally, our role is to make sure consistent, high quality patient information is available in appropriate alternative formats to local screening providers. We have a long way to go to fulfil this role but we will be developing consistent processes and high quality resources for each of the 11 national programmes for people with sight loss. Local screening providers will then be able to download these from GOV.UK as and when needed/requested. Nationally, we will only provide hard copy Braille versions of leaflets in response to individual requests. This makes sure our response is proportionate and cost effective. Local screening providers should send any such Braille requests to us via the screening helpdesk. Please first check that the individual actually wants it in Braille and wouldn't prefer information in a different format. More information on the Accessible Information Standard is available from the NHS England website in a range of formats, along with a range of resources to support effective implementation of the standard, including links to e-learning modules. You can also email NHS England at england.nhs.participation@nhs.net or telephone 0113 8253002.